Paris (CNN)We will rebuild. 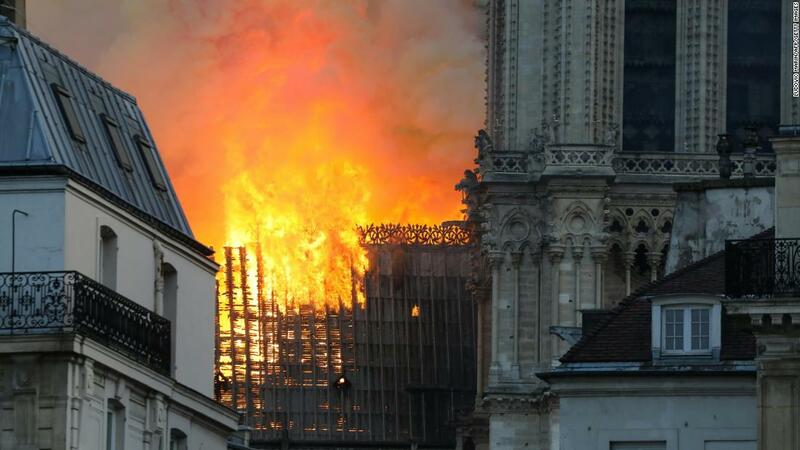 That was the message President Emmanuel Macron had for the people of France, as they and the world watched in shock when the historic Notre Dame cathedral burned Monday. 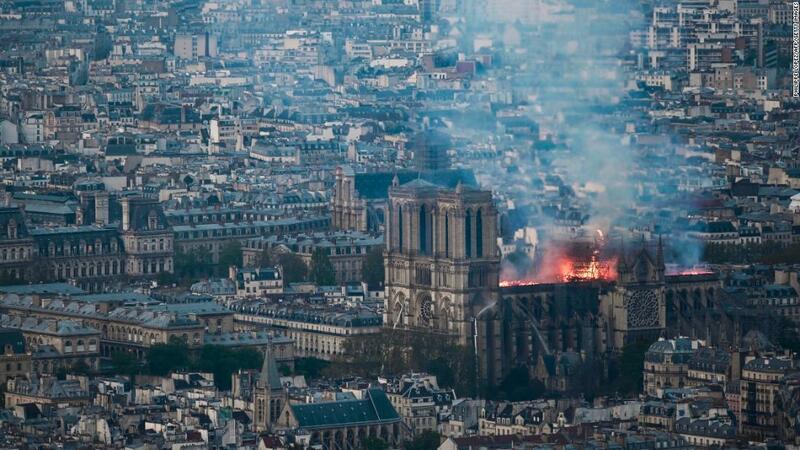 Speaking from the scene of the fire in the French capital Paris, Macron described the fire at the 850-year-old Gothic masterpiece as a “terrible tragedy,” but added the “worst had been avoided.””I’m telling you all tonight — we will rebuild this cathedral together. This is probably part of the French destiny,” he said. 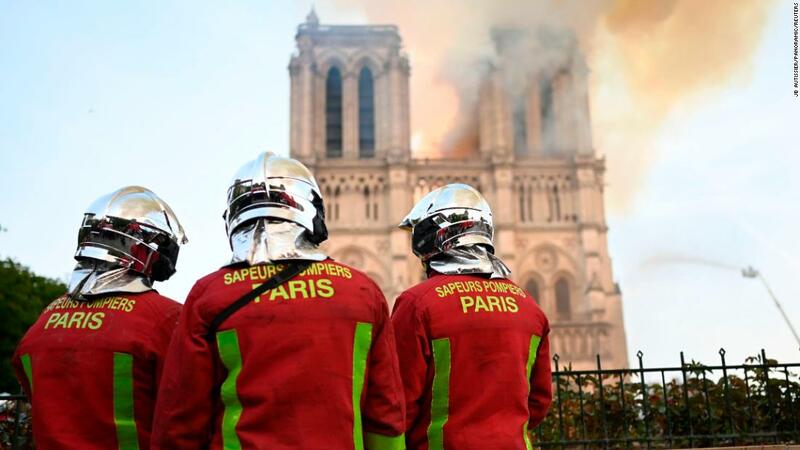 “Starting tomorrow, a national donation scheme will be started that will extend beyond our borders.” The fire broke out Monday evening and raged for several hours before 400 firefighters, working with skill and precision to avoid further damage to the medieval landmark, managed to bring it under control. 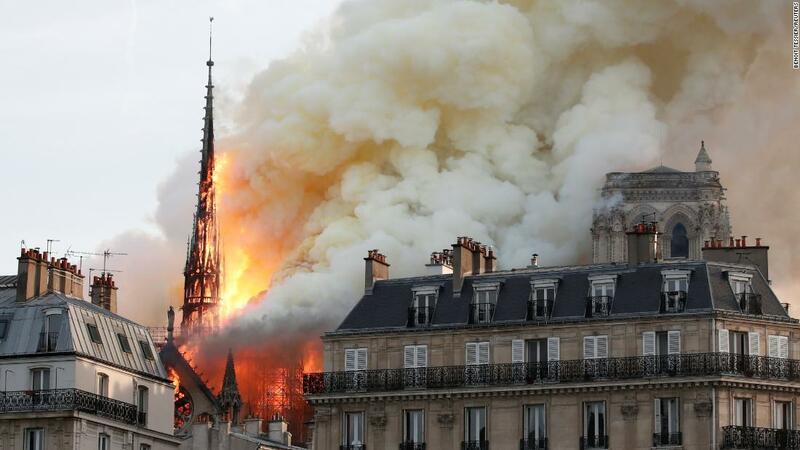 They were unable to save the spire, however, which burned to a blackened shell before finally toppling as thousands of Parisians who had gathered in the streets watched in horror. 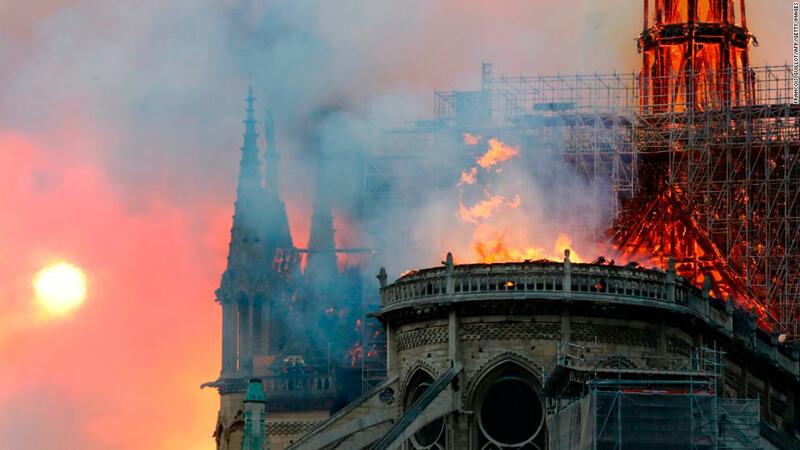 Most of the roof was also destroyed.Read More”Notre Dame is our history, it’s our literature, it’s our imagery. It’s the place where we live our greatest moments, from wars to pandemics to liberations,” Macron said.”This history is ours. And it burns. 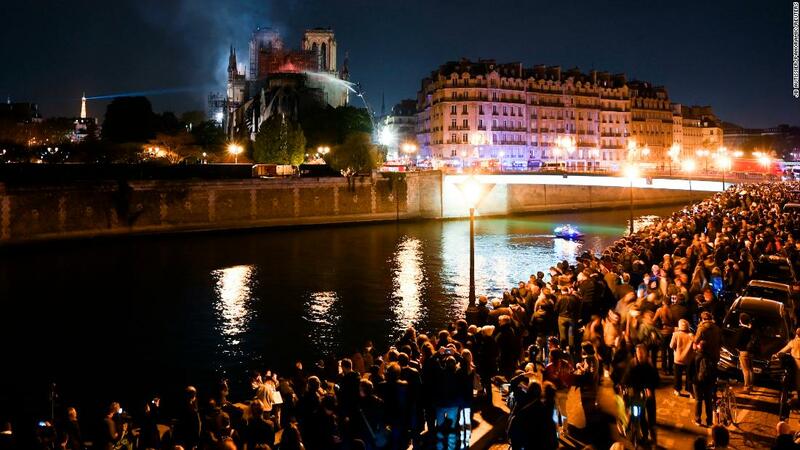 It burns and I know the sadness so many of our fellow French feel,” said Macron. Shock and horrorIt was not immediately known what caused the fire. The cathedral is surrounded by scaffolding amid construction work. 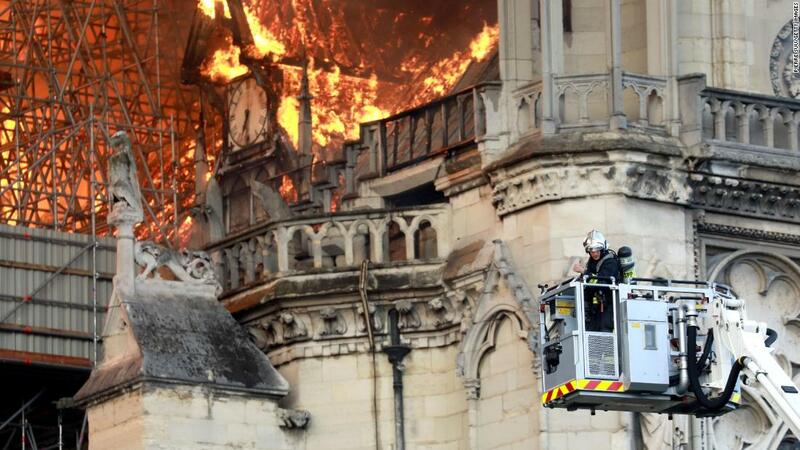 Paris Fire Brigade Commander General Jean-Claude Gallet said the initial call to emergency services notified authorities of a fire in the attic of the cathedral.About 400 firefighters were mobilized to deal with the blaze, the French Interior Ministry said. 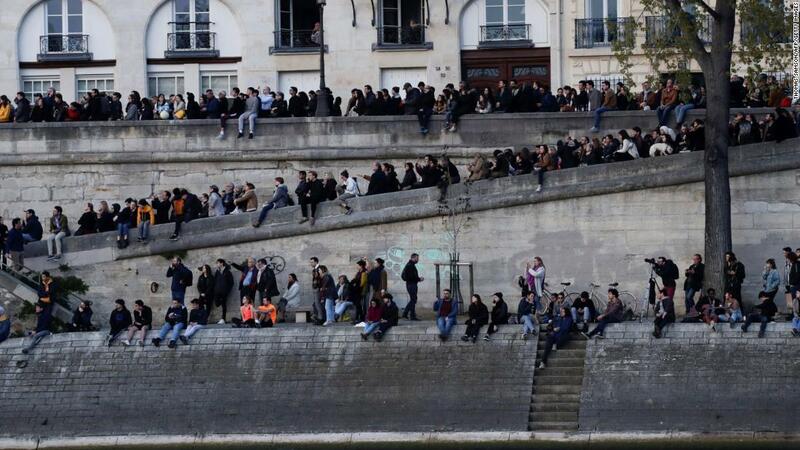 Firetrucks had difficulty accessing the scene, located on an island in the Seine, amid the daily afternoon rush hour. 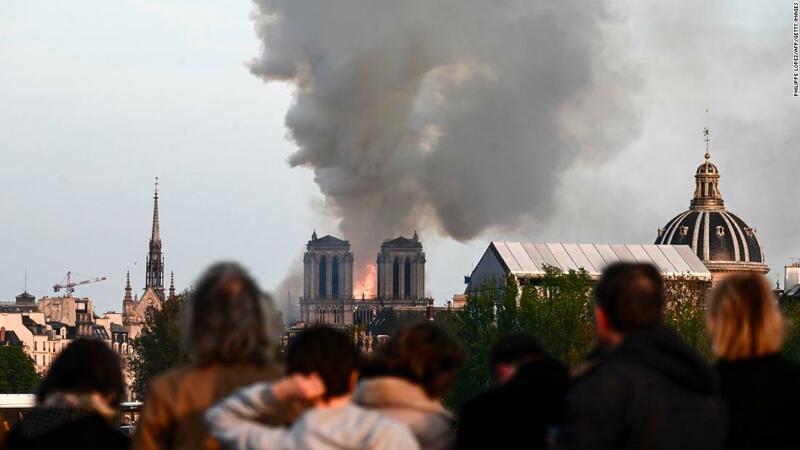 Police urged the public to avoid the area.Firefighters atop cherry-picker cranes sprayed water onto the church to try to douse the flames.One firefighter was seriously injured, Gallet said.Thousands of Parisians and tourists gathered to watch the blaze. 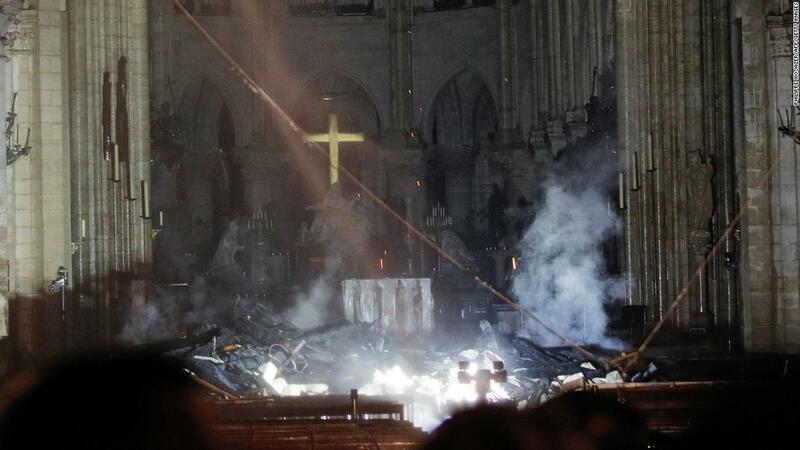 The crowd sang hymns as, a few days before Easter, one of the symbols of French Catholicism burned in front of them. “It’s awful to see such a symbol disappearing in front of you. 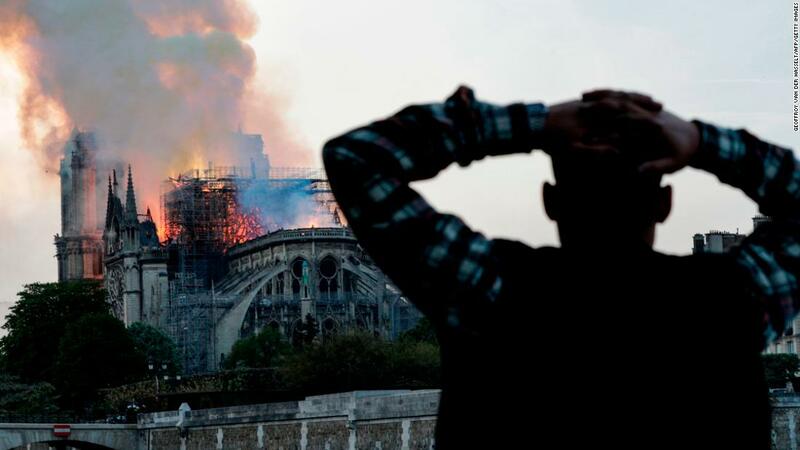 It’s been there for so many years and in a few minutes half of it disappeared,” local Thibaud Binetruy said. 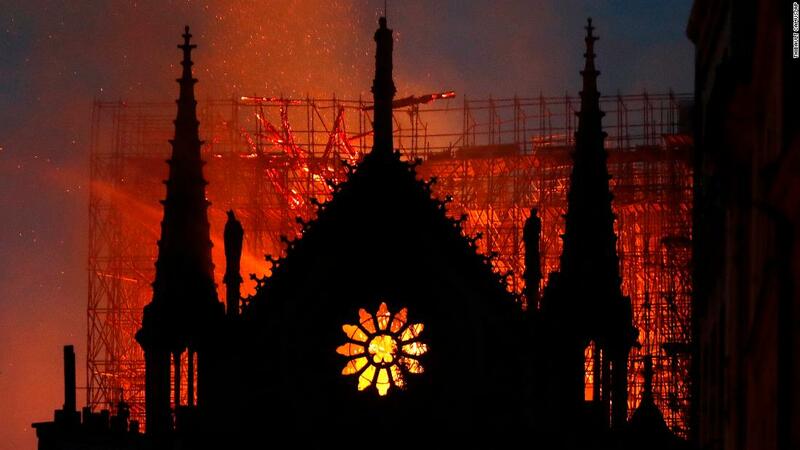 “Paris without Notre Dame, madness.”Another witness, Anne Marie, spoke with tears in her eyes.”In Paris, it’s a monumental symbol — every person with different religions are really moved and saddened,” she said. 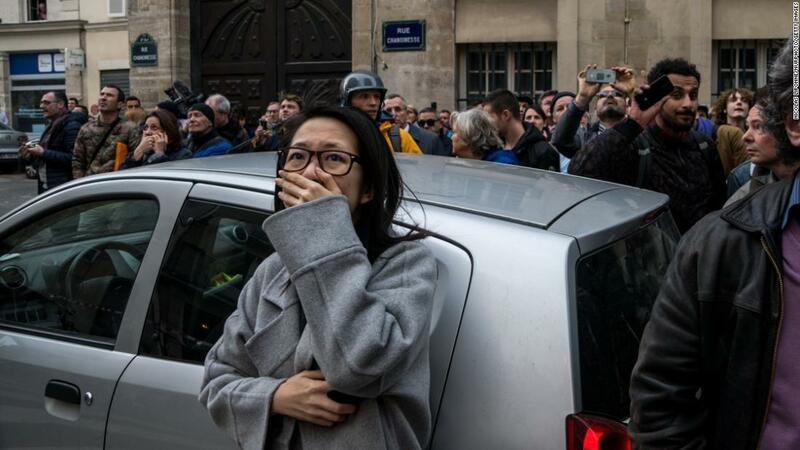 “Paris without the cathedral is not Paris anymore.” Messages of support and mourning poured in from around the world. The Vatican said the Holy See learned with “shock and sadness the news of the terrible fire that has devastated the Cathedral of Notre Dame de Paris, symbol of Christianity, in France and in the world.”The fire at the Notre Dame cathedral “goes beyond Paris,” the city’s archbishop, Michel Christian Alain Aupetit, told CNN”I received a supportive message from the Chief Rabbi of Paris. Everyone is writing in to share their feelings. This goes beyond Paris. 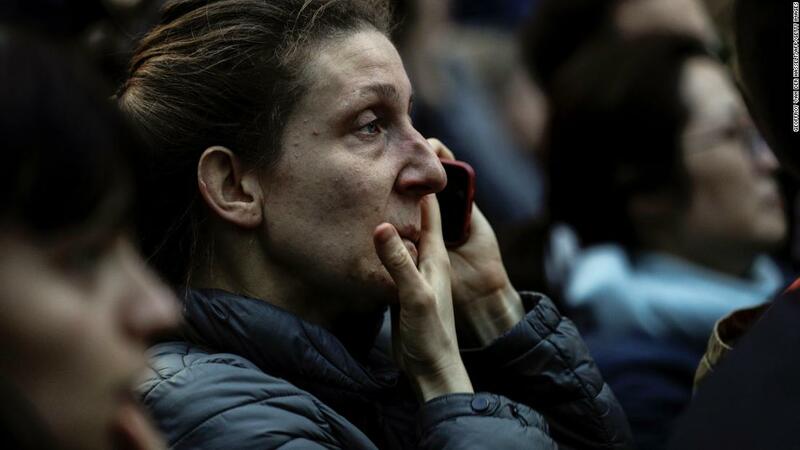 People are reacting worldwide,” Aupetit said.Turkish Foreign Minister Mevlut Cavusoglu described the fire as a “disaster for all humanity,” while the Mayor of London, Sadiq Khan, said the British capital “stands in sorrow” with Paris. 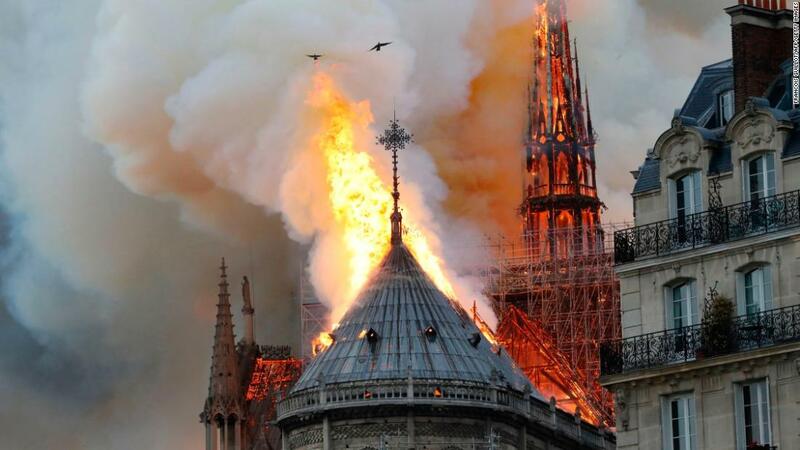 “Heart-breaking scenes of Notre Dame cathedral in flames. London stands in sorrow with Paris today, and in friendship always,” Khan said on Twitter.US President Donald Trump also weighed in, calling it a “terrible, terrible fire.” His suggestions on how to tackle the conflagration were less welcome than his sympathy however. 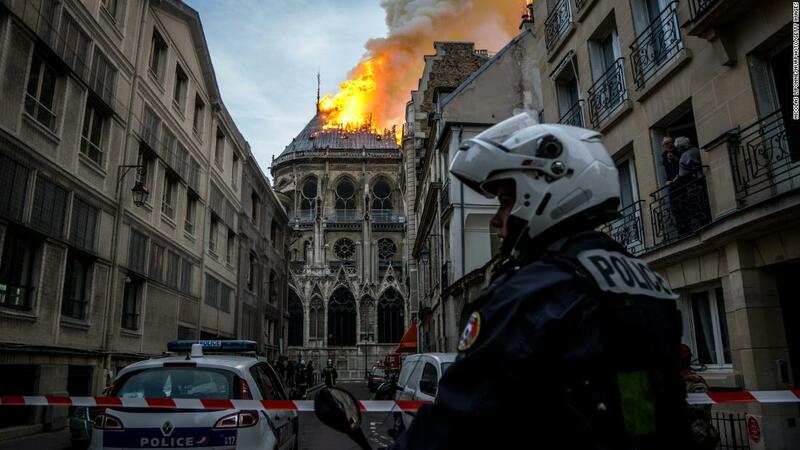 The French Civil Security Agency pushed back against Trump tweeting that “flying water tankers could be used to put it out,” pointing out that dropping water on the ancient church could cause its collapse. A symbol of FranceNotre Dame’s foundation stone was laid in 1163 by Pope Alexander III, and the cathedral was completed in the 13th century. With its towers, spire, flying buttresses and stained glass, it is both an architectural jewel and a major religious and cultural symbol of France.Located in Ile de la Cite, a small island in the middle of the city, the cathedral is one of Paris’ most popular attractions, drawing an estimated 13 million visitors a year.Even as it fell into disrepair over the centuries, it was the site of Napoleon Bonaparte’s coronation as emperor in 1804. 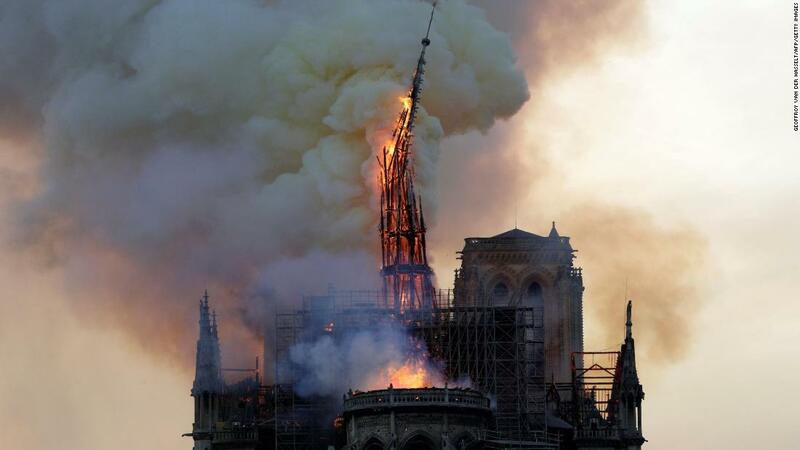 The central spire was built in the 19th century amid a broad restoration effort, partly buoyed by the success of Victor Hugo’s novel “The Hunchback of Notre-Dame” in 1831.Renovation was underway before the fire. 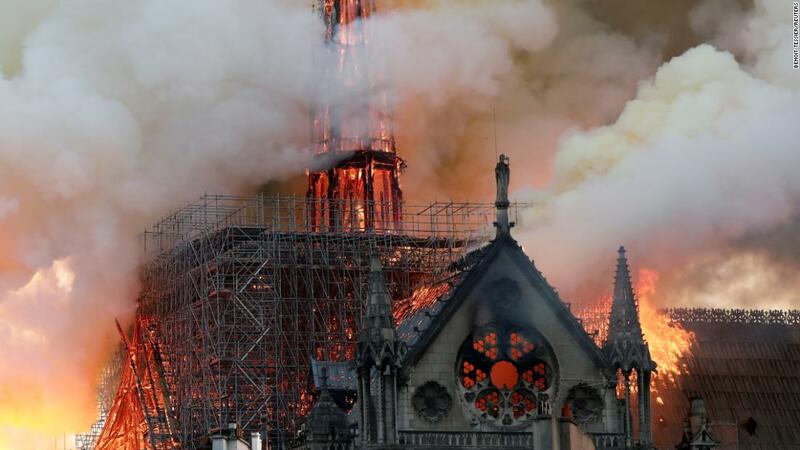 A small silver lining from the blaze may be that the restored spire and roof will be built to be modern standards and better equipped to withstand future fires. 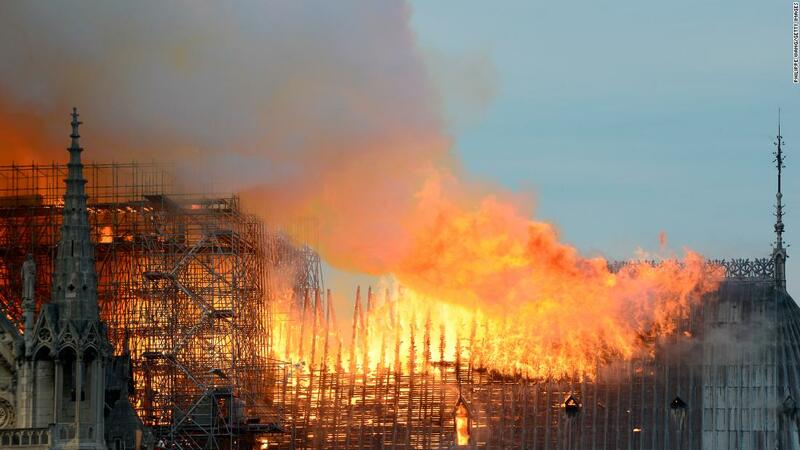 Experts have pointed to other fires at historical sites, such as that which engulfed the UK’s Windsor Castle in 1992, that were followed by comprehensive restoration projects. Windsor took five years to restore, but is now in a better state than before the blaze.